All outlook.com accounts are migrating to Office 365. Outlook.com accounts can be configured as Exchange accounts in Outlook 2010 and up. Outlook 2007 users will be able to set the accounts up as Microsoft Exchange until October 31 2017, after which they will need to upgrade or use POP3 or IMAP. 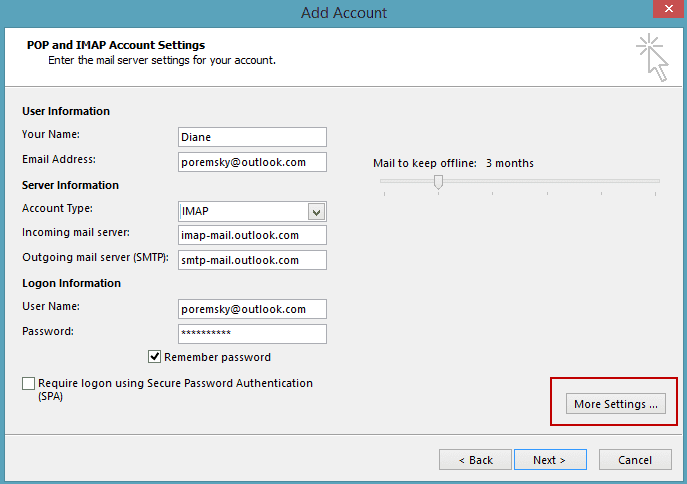 Outlook 2007 supports only one Exchange account and users with more than one Outlook.com or Exchange account in their profile will need to use IMAP for the additional accounts (or new profiles). Outlook 2003 users will still need to use POP3 or IMAP. 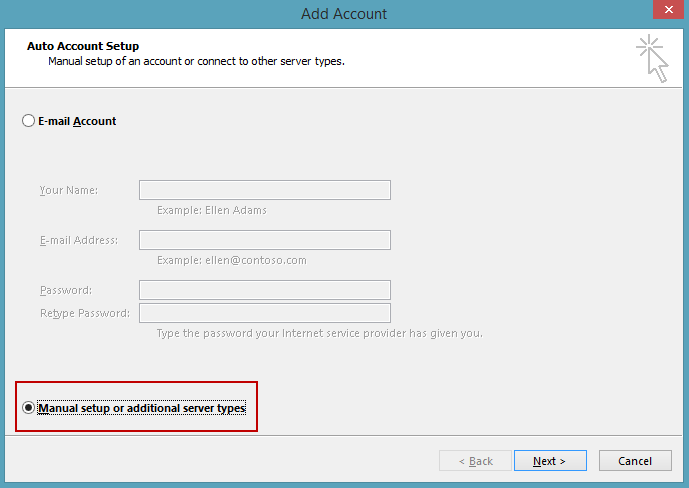 See "Outlook.com Migration Status" for the steps to remove the connector accounts and set it up as Exchange or IMAP. Articles on the new Outlook.com. You can use IMAP or POP3 with Outlook.com accounts if you don't want to use Microsoft Exchange, such as, if you only need email or are using Outlook 2003 or Outlook 2007 and more than one Exchange account. You can access your Outlook.com email with any email client that supports IMAP, including Outlook 2011, Thunderbird, and more. If you are only using Outlook.com for email and don't need to sync Outlook.com calendar and contacts to your desktop, setting the account up as an IMAP account could be a better option. 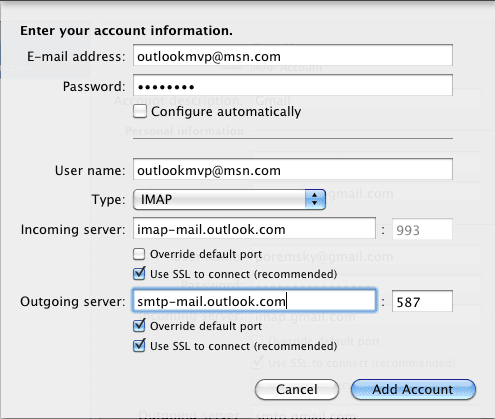 Outlook 2007 doesn't support multiple Exchange accounts in one profile but you can add additional Outlook.com accounts to your profile as IMAP. These steps work with migrated Outlook.com accounts. Note that Outlook 2003 users will need to use port 25 or port 587 and SSL, not TLS, to send mail. Note: if imap-mail.outlook.com seems slow to download mail, try using outlook.office365.com as the incoming server name instead. 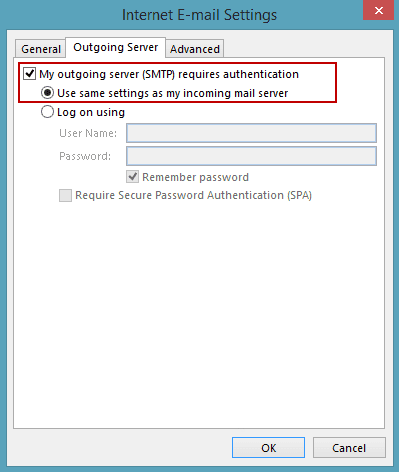 You'll need to use the manual setup option when you configure an Outlook.com IMAP account in Outlook. Choose POP or IMAP from the next screen. Click Next. Enter your display name and email address and the Outlook.com IMAP server names. Use your email address for the account name and enter your password. On Outgoing Server tab, enable outgoing authentication, using the default of same as incoming. 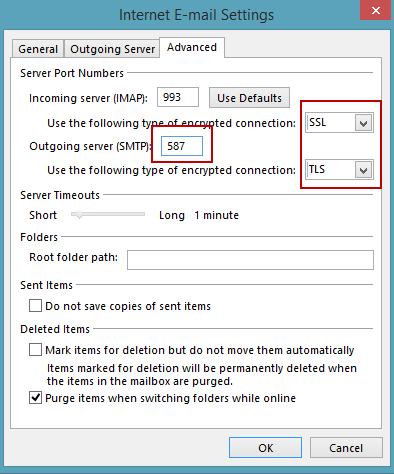 On Advanced tab, select SSL under Incoming Server (IMAP) and TLS for the Outgoing server. Change the Outgoing server to port 587. (The Incoming Server port should update to 993 automatically when you choose SSL). If you prefer to Purge your mail yourself, and not automatically when you change folders, change the setting at the bottom of the Advanced tab. Adjust the Sync Slider if you want to sync more than the last 3 months to Outlook. Click Next to test the settings and exit the dialog. Outlook 2011 users will new to use a manual setup, at least short-term. Autodiscovery will eventually be updated to choose IMAP, but for now, use the manual method with the server names above. You'll need to change the SMTP port and both SSL boxes should be checked, as seen in this screenshot. I got my settings figured out, thanks to you guys. I use Office 365 with both a gmail and and an IMAP e-mail account. Both accounts have been setup on OutIook365 and my gmail and IMAP account e-mails are syncing on my laptop and Android phone (i have the Outlook app loaded). However my gmail calendar only reflects on my Android phone and does not sync with Outlook on my laptop. Please note that my Outlook Calendar on my laptop denotes "(This computer only"). Also on the Outlook app on my phone I can only book appointments using my gmail account and not with my IMAP account also my IMAP account calendar does not sync on Outlook. I understand that I can use Outlook.com to sync the calendar for my IMAP e-mail account to my Android Phone/Tablet in the background. I have tried setting up the IMAP e-mail account on Outlook.com and received the following error message "A TLS API error occurred. Error = 0x80090326"
I have mailed Microsoft support on 3 separate occasions with no response. The e-mail ticket number on my last e-mail is 5240071. It has been 3 weeks now. Could you please assist or advise urgently as I am at my wits end. I use Office 365 with both a gmail and and an IMAP e-mail account. Both accounts have been setup on OutIook and my gmail and IMAP account e-mails are syncing on my laptop and Android phone (i have the Outlook app loaded). However my gmail calendar only reflects on my Android phone and does not sync with Outlook on my laptop. Please note that my Outlook Calendar on my laptop denotes "(This computer only"). Also on the Outlook app on my phone I can only book appointments using my gmail account. How do I resolve this? Forgot to mention I also have office 365 - if that something you need to know. I am at wits end. We have a out of state server with our email set up .. my computer has acted up a few times. My email worked for awhile, went on line remotely for help.. became completely confused with Outlook Live and the outlook acct. I already have. I dont need the Live version. This is an email for our business. Thats it. I dont use Edge - dont like Bing. I stayed with google chrome. I reset my password.. however it appears it was for the LIVE version. This is making my HAIR HURT! All I want to do is reset up my OLD OUTLOOK email using my old imap and pop3. This should not be this difficult. I also noticed that my office is not working right.. it gets hung up sometimes in excel and in word- says not responding. I do not want to use cloud... which may be another issue. When you use outlook 2003, you need a PST file set as default for calendar and contacts but can set the imap account as default for sending email. If the only account in your profile is the imap it should be the default email account for sending and the PST should the default. New messages, forwarding and replies should work like before. Are you getting any error messages when you try to forward links? I'm not in my office today or I'd make you a video showing how to do it. If both are set up as Exchange accounts my Outlook profile corrupts regularly, and I have to set up a new profile. I also have a gmail account and another account set up as IMAP. Appreciate any help in sorting this out as it is not feasible for me to run 2 separate profiles and keep logging in and out. You defintely shouldn't have problems with the accounts in Outlook 2016. I'm assuming both are setup as Exchange? You don't have the business address set up as a Microsoft Account, do you? They no longer allow Office 365 business accounts to be used as Microsoft accounts because it causes problems, but it was possible to do this years ago. If you do have the business address added as a microsoft account, add an outlook.com alias to the account and delete the business address from the microsoft account.